If you’ve never honey-roasted your feta before, you’re about to take your taste buds into the taste stratosphere. 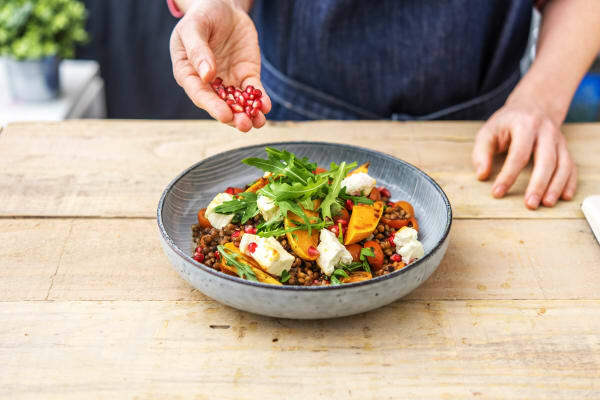 Combining golden, creamy feta with lemony garlic lentils, earthy sweet potatoes, peppery rocket and fresh pomegranate seeds is a flavour combination you’re going to love, and one you’ll be creating time and time again. You can thank us later. Preheat your oven to 200°C. 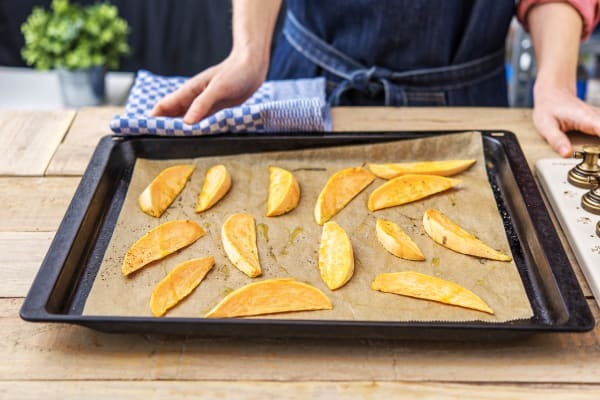 Chop the sweet potato into wedges about 1cm wide (no need to peel!). Put them on a lined baking tray and drizzle over some oil. Season with a pinch of salt and pepper. Roast on the top shelf of your oven until crisp and golden, 25-30 mins, turn halfway through cooking. Halve, peel and chop the shallot into ½cm pieces. Halve the cherry plum tomatoes. Peel and grate the garlic (or use a garlic press). 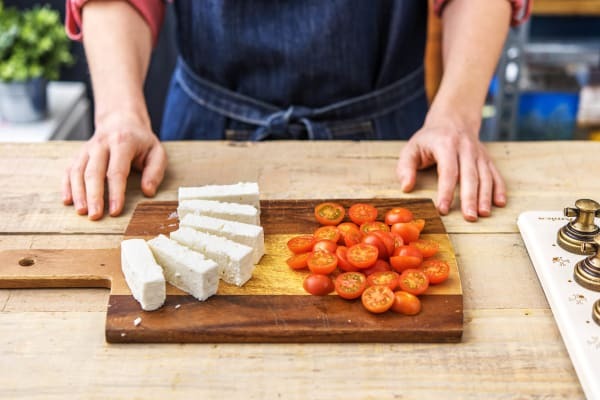 Slice the feta cheese into six long rectangles. Drain and rinse the lentils in a sieve. Lay some foil on another baking tray and pop the tomatoes on one half. Drizzle over some oil and season with a pinch of salt and pepper. Put the feta slices on the other half and drizzle over some oil. Once the wedges have been in the oven for 15 mins, put the tomatoes and feta on the middle shelf for the last 7-10 mins of cooking time. Meanwhile, heat a drizzle of oil in a frying pan on medium heat and add the shallot. Cook, stirring frequently until soft, 4 mins. Add the garlic and cook for 1 minute more. 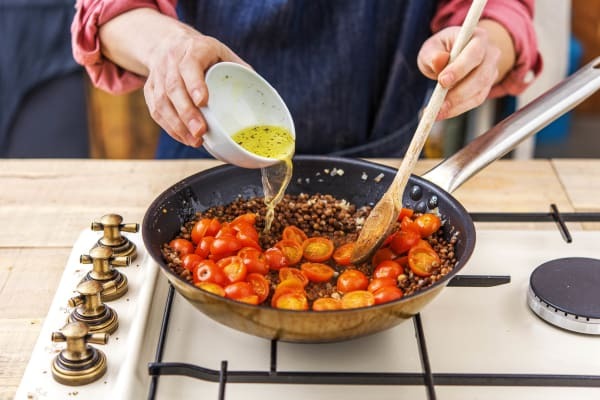 Tip the lentils into the pan along with a good pinch of salt and a grind of pepper. Stir well. Warm the lentils through, 3 mins, then remove from the heat. Squeeze the lemon juice into a small bowl and add the olive oil (see ingredients for amount). Season with a pinch of salt and a grind of pepper and whisk together with a fork. 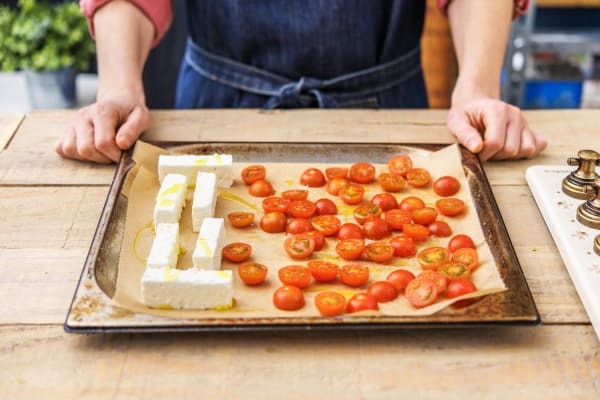 Once the wedges, tomatoes and feta are cooked, remove from the oven. Turn your grill to high. Add the tomatoes to the lentil mixture along with the lemony dressing. Squeeze the honey over the feta and pop under the grill for 2 mins. 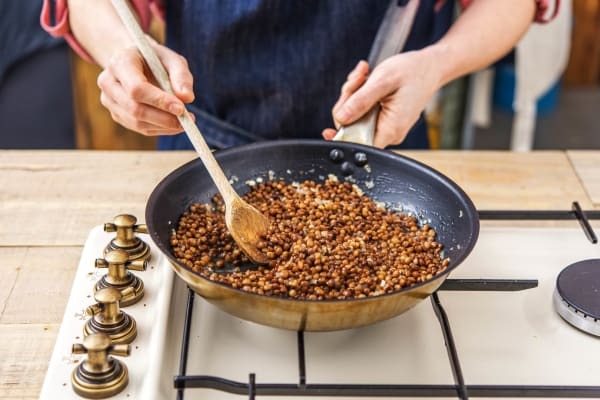 Spoon the garlicky lentils into bowls. Place your wedges and feta on top (if it breaks up don't worry, it will still be delicious!) 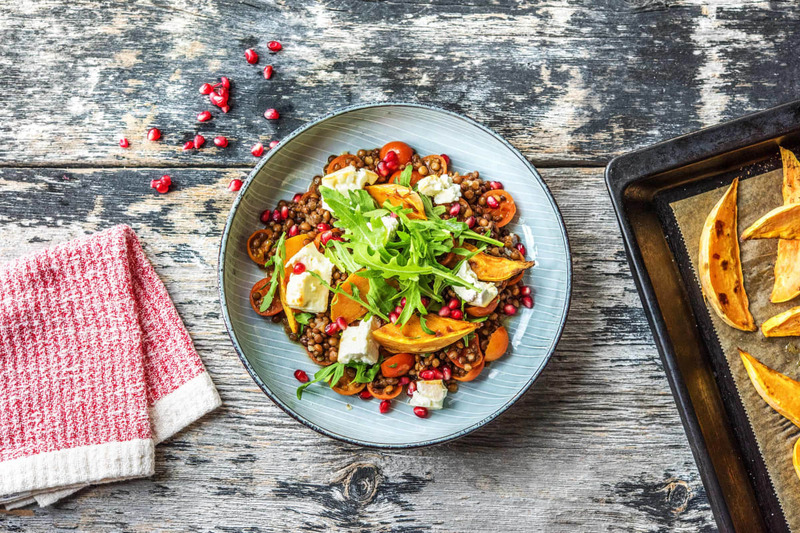 Top with a handful of rocket and sprinkle over the pomegranate seeds. Enjoy!